They average out at 30% declines over 4.5 weeks. If it seems unlikely that we could see such a swift collapse after seeing such persistent strength, then know it is exactly what happened under these historic instances of similar extremes in valuations, sentiment, allocations, leverage, divergences and – for some – the peaking of the solar cycle. The lop-sidedness in sentiment and allocations, the excess leverage, the levitation above the 200MA, the mature divergences in place since the start of January: all together produce the ideal set up for waterfall declines or panic selling. That gives us a window of 2-3 months in which we could see market falls, but the ranges from the historical mirrors further up are shorter at 2-8 weeks. So might I be wrong about the significance of yesterday (could we now rally up and print a new high in August before seeing the hard declines?) or might I be wrong about this being the ‘second chance’ peak (could large caps fall some more but then rally up again to a lower high in August/September, before hard falls erupt?)? I can’t rule either out, and the window we have (August-October) allows for both possibilities. However, my analysis puts us at the second chance peak, and the speculative-target sectors and indices of IBB, SOCL and RUT have all made clear lower highs making them likely to erupt from here into heavy falls. Could they potentially diverge from large caps? Also not impossible, but I suggest it is unlikely that small caps see panic selling whilst large caps rally or consolidate. However, if that was the second chance peak giving way, then there should be little chance given now to either get out of longs or add short, i.e. any bounce should be short-lived and the down days very unforgiving. If the markets were to sell off again today, then historically we have seen some instances of heavy falls on the Monday following weekend worrying, so something to bear in mind. We have another week of negative lunar pressure next week, which adds to the bearish set-up. But let’s see if a bounce can be mustered today per those indicators. If I am correct about the waterfall declines hitting now in this Aug-Oct window then drawing on those historical mirrors again, we ought then to expect a subsequent slower partial retrace of those falls lasting around 4 months. So hard falls averaging 30% over 4 weeks followed by a 50%+ retrace of those falls averaging 4 months, before we tip conclusively into a full bear market. The key then will be trying to gauge by when and at what level the panic selling leg is complete. As an initial marker, the lightest falls in those historical analogs were 18% which would be 1629 on the SP500 from the 24th July top. So as a guide I will be looking to refrain from taking any short profits until we hit at least there, but indicator readings will help refine that as we progress. All subject to confirmation of course from the markets. It was just one day yesterday, but it does look like a killer punch, at the right time. On 17 Sept 2001, the Dow Jones plunges 684 points (almost “7”00 points ) or over “7” percent after the 9/11 attacks. “7” years later, on 29 Sept 2008, the Dow Jones drops “777.7” points or “7” % in reaction of the US failing to approve the first vote on the Wall Street bailout. Lucky or unlucky number “7” ? Perharps, Lagarde meant to say sell in the “7” month of 2014 ??? Thanks John you read my mind. I was about to suggest that we do recap on time frames and targets for this second chance decline. It is getting interesting. As I just stated in the previous thread, the futures are in far worse position going into today than they were at this point yesterday. That is suggestive of increasing momentum, ie. the snowball effect and unless the bulls can reverse it very quickly this could be crash worthy next week. Thanks John for your keen analysis and timely updates and targets. July may have put in the 65 month top. August is coming in strong with 66 month reversal energy. There is downward cycle pressure until Aug 11-12. 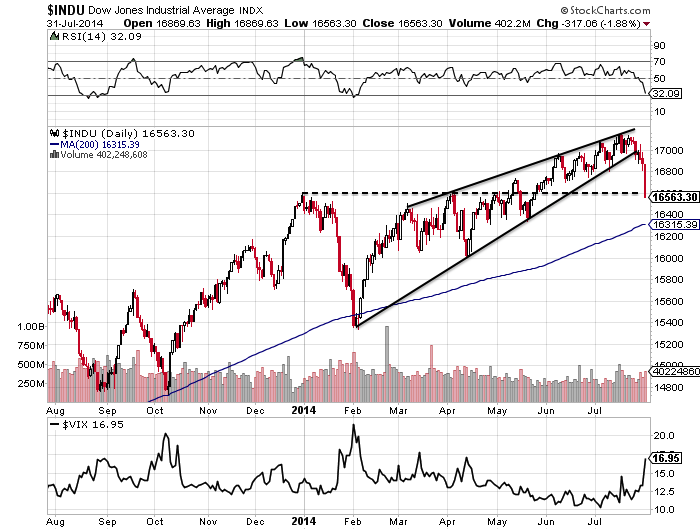 The wedges on the Dow and S&P indicate the traders are all on one side of the boat. Now that the wedges are breaking as John mentions, It is going to be a race for the other side. The repo/leverage unwinds are starting in Europe and the waves will be felt here on the US shore shortly. The selling here currently is rather orderly. When the repo chain starts breaking, the selling will become disorderly and waterfall like. Liquidity may be stalled as money market redemptions can now be frozen. The bounces will have to fight the large divergences on so many indicators. John, the fact that your geomagnetic/lunar phase oscillation model has its peak July 26 and that aligns with Christine Lagarde’s IMF magic sevens July 27 date, the beginning of the seventh lunar month, tells me that the Fed clearly understands natural law. If that is so, they have been profiting by it handsomely. Well done for developing a coherent constructive model that can account for many historical and current data points. It must so fascinating for yourself to watch your model describe the natural forces in action. Cab somebody, ANYBODY please explain to me how or why unemployment rises and GDP literally explodes? John, I really enjoy your work. Hope your health is better this year. I have been on a âlife style clean-upâ for the last 5 years, last December â just as everything was completing, I had a heart attack, fixed with one stent, yoga. Hope you are getting the âbalance in your lifeâ you need. Thank you very much for sharing your road map, John–it is extremely generous of you. You make a strong case and draw upon a variety of sources. You have certainly helped me put the current market in some sort of coherent context. Jul 28, 2014 has the moon at apogee with the farthest distance away (406,570 km) over the 3-year span in the period Jan2013 to Dec2015 in the future. Some other poster mentioned this is approximately the midpoint. On Jan16, 2014 the moon was also at apogee over the second farthest distance away for the same 3-year span and only slightly shorter at 406,537 km. On Jan16, SPX confirmed a failed retest of the Dec31, 2013 highs and during the next two weeks SPX fell about 6% from 1850 to 1740. I would not be surprised to find weakness in the market from the Jul 28 to Aug 11 period with possibly SPX hitting 1890-1900 or just around the 20-week moving average. But my expectations are only for a minor dip well under 10% from the 52-week peak. Any further crash like scenarios would be quite speculative even at that point. I personally agree with you on your view. Remember that Alibaba is pending and market will not see major fall before that IPO, if it falls who will subscribe ? :-). Do continue to post your views it is appreciated. this map and is it every year so accurate? Great analyses you make and i wonder why you just dont trade with that map as your guide (geomagnetism and lunar phase oscillation)? Thanks. The seasonality doesn’t change, the lunar phasing moves on each year. Both work more often than not, but the market can have unseasonal years and does not always follow the lunar oscillation. No Hindenburg warning yet. Highs and Lows passed each other in the night. What gives? This is a continuation of the posts that I have been making for the past year speculating on a market high in the July timeframe followed by a decline into around October – November. It looks like the decline is starting. As I have stated before, after the bottom around October – November, I speculate that the market will bounce into 2015 and probably reach new highs into 2016. I expect this because of the presidential cycle and because every year ending in 5 has seen an increase in the market. After that, probably a decline. But, since I think that we are in a long term bull market, the decline will probably be followed by another move up. Could there be one more short squeeze? 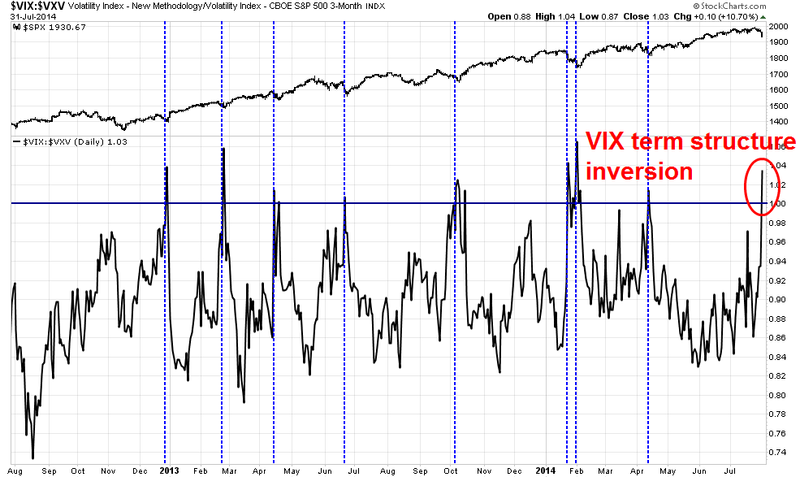 VIX still low weekly/monthly for major top. guide post for measuring the equities decline the usd/yen could give clues. Average 2 month moves after such extended lull in volatility since 2011 have been 9pct moves in the pair. The move down just started this morning and has plenty of time and distance to run. Target 98 and 93/94 for the next 2 months respectively from 103. Waiting for the Nikkei to join in the global selling as well. Has been unusually strong helped by weak fx boosting corporate earnings. Next 2 months should be the money maker for the shorties. Thanks John and the rest of you guys. I was right also, buckle up your seat belts! EWI has the SPX at end of wave 5 of V on July 24 and also the Dow at the end of wave 5 of V on July 17, so they are also looking for a lot more downside (this time they could be right?). But since Small Caps are very vulnerable to breakdown, we might end up getting a shortened wave 2, second chance, on the Dow and SPX. SPX 1987 = “7” on 7/31/2014. The Elite always like to and also need to tell us ahead of time what they plan to do in order to lessen their Karma. They also like to use astrologically and cosmically sensitive time frames for their False Flags etc. to get the most bang for the buck. If anyone is interested i publish a free newsletter based on proprietary time cycle calculations for S&P500 and ASX200. – sell signals that have been 88% accurate in 2014. – S&P500 alerted subscribers regarding a July 29/30 sell signal prior to the decline. 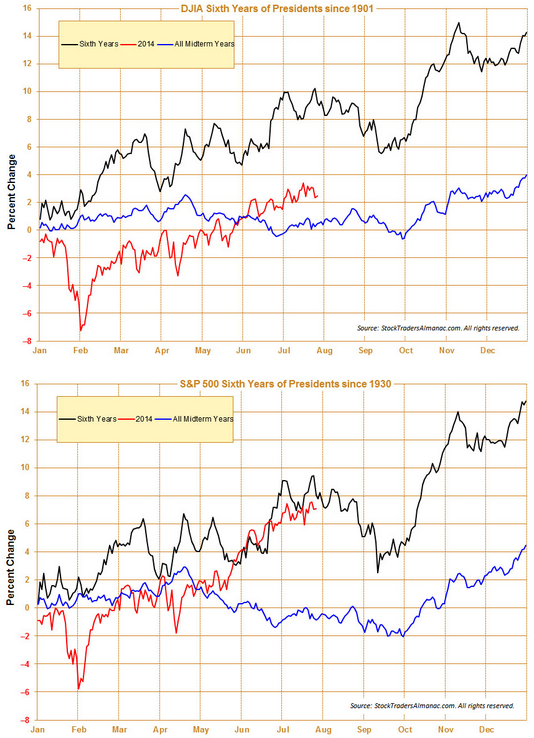 – S&P 500 caught all the major market highs in 2014. Like i said its free and will remain that way, cheers.